Ideas about the transmission of disease have long formed the core of modern biology and medicine. Heredity and Infection examines their development over the last century. Two scientific revolutions - the bacteriological revolution of the 1890s and the genetic revolution at the start of the twentieth century - acted as the catalysts of major change in our understanding of the causes of illness. As well as being great scientific achievements, these were social and political watersheds that reconfigured the medical and administrative means of intervention. 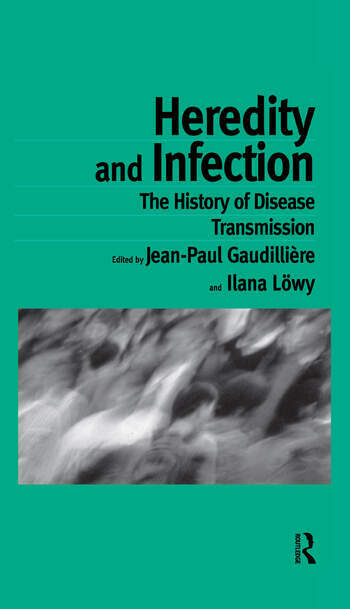 By establishing a clear distinction between transmission by infection and genetic transmission, this shift was instrumental in separating hygiene from eugenism. The authors argue that the popular perception of such a sharp divide stabilized only after 1945 when the use of antibiotics to end epidemics became commonplace. For health professionals the separation has never become an absolute one, and the book examines the various blends of heredity and infection that have preoccupied biology, medicine and the social sciences. Heredity and Infection recontructs the changing epidemiology of such historically important pathologies as tuberculosis , cancer and AIDS. In doing so, it demonstrates the role of experimental models, medical practices and cultural images in the making of contemporary biochemical knowledge.